This year 114 student leaders and athletes and 26 adults turned out to do yardwork and outdoor chores for elderly neighbors in Gladstone. Gladstone High's sixth annual Give It Back Day is an opportunity for students to show appreciation for the community's support of school and athletic programs. 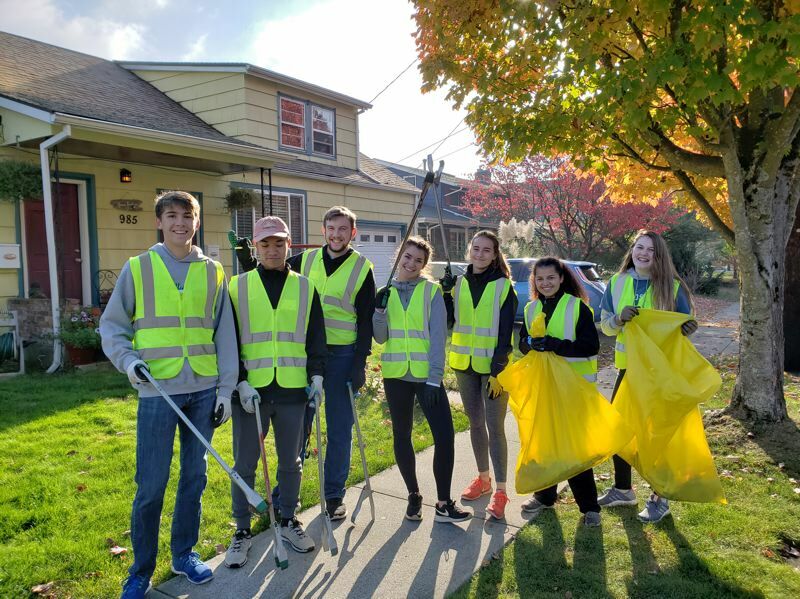 Students raked leaves, pulled weeds, mowed lawns and pruned hedges at 24 different homes. They also worked to lay bark chips on trails at the Gladstone Nature Park and picked up litter on Portland Avenue. "Give Back Day shows the community how giving and hardworking our students are," said event leader Lynnda Prom. "It's a pleasure to give back by helping neighbors who need a hand." Oregon City's Gaffney Lane Elementary has two certified therapy dogs "on staff." 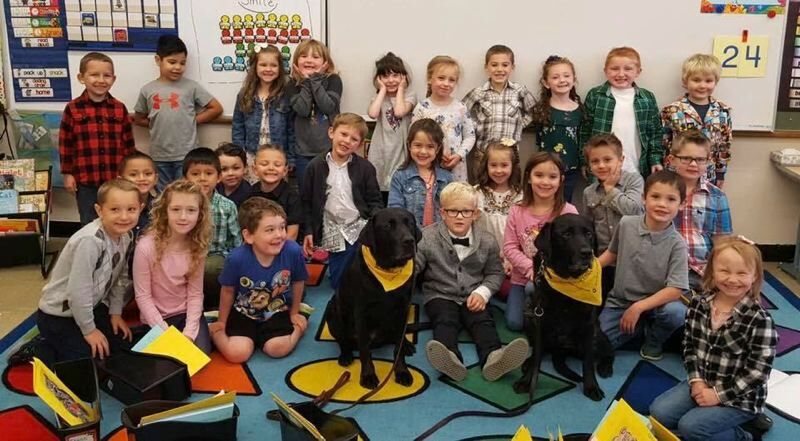 Gus and Pete are black labradors that take an active role in the school day, listening to students' frustrations and celebrations, calming them down, and providing an audience as they practice reading aloud. The dogs also are part of the Friends at Recess program, encouraging friendship-making skills in a fun way. Even before the school year began, volunteers at Gardiner Middle School in Oregon City found a way to refocus school culture on kindness, caring and positive thinking. Using materials donated by Verhaalen Painting, they set out to transform school bathrooms from dull, institutional facilities into colorful, inspiring places. Different quotes adorn the walls in each bathroom with colorful images of butterflies, cartoon animals and flowers, with messages like "Kindness changes everything," and "Be the reason someone smiles." 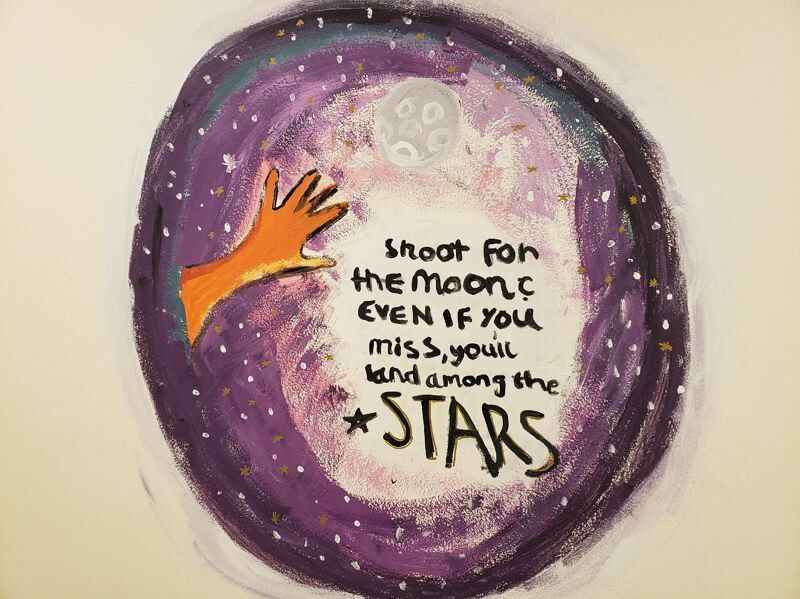 Messages also encourage students to develop a positive self-image, with phrases like, "Beauty is everywhere, especially in you." The Clackamas Community College Budget Committee is seeking two new citizen representatives to deliberate this spring on the proposed budget and approve it, before sending it to the CCC Board of Education for final approval by June 30. The committee includes the CCC Board of Education and seven volunteers appointed by the board for three-year terms. Committee members represent each of the college's six zones. Visit clackamas.edu/district-map to see if you live in eligible areas for the current openings in Zone 2 (Happy Valley) or Zone 7 (Canby and Molalla). Applicants must be registered voters and reside in the zone for which they are applying. Applications must be received by Nov. 9, and committee members will be announced Dec.14.